Stefan Kudoke knew that he had to be a great watchmaker. His mother told him so. And after that "career guidance" he immersed himself in the art of fine watchmaking. Stefan hails from the small east German city of Frankfurt Oder, and began his studies from scratch. 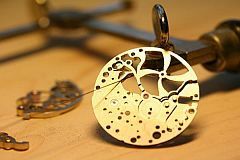 Two skilled masters worked with him to both teach and appreciate the mechanical process of creating watches by hand. His outstanding talents allowed him to complete his studies with honors, and he was awarded first place in a watchmaking competition in the German state of Brandenburg. Stefan went on to win third place in a national watchmaking competition. After completing his studies and fine tuning his skills, Stefan moved to Glashutte, Germany, considered by many to be the "meca" of German watchmaking. His talents were recognized by Glashutte Original, where he was employed in their special workshops for developing complications and new prototypes. Next, after receiving Germany's highest certification as a Master Watchmaker, Stefan traveled to the United States to spend time with Breguet, Blancpain and Glashutte Original in New York. Although he never quite mastered the New York accent, Stefan considers his time spent in the US to be among his favorite. And then the "bug" hit. Sensing that his calling was in creating unique timepieces, Stefan completed a four year course in economics, business and marketing at the University of Applied Sciences in Lausitz to lay the foundation to start his own company. And that's how the brand Kudoke was born. 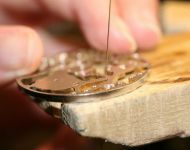 In addition to his skills as a Master Watchmaker, Stefan taught himself the arts of skeletonizing and hand engraving, all of which play a role in Kudoke watches. Stefan will never produce watches in large numbers - he believes in hand workmanship from start to finish. For example, he is one of the very few watchmakers to create his own dials, hands and other movement parts. To see our collection of watches from Stefan Kudoke, please click here.